Background and objective: Xerostomia is a subjective measure of dry mouth, while hyposalivation is an objective measure of reduced saliva flow rate. In this study, we aim to assess the association between commonly used xerostomia scoring systems, with different hyposalivation measures among Sjogren Syndrome (SS) patients. Methods: In a cohort of SS patients, we assessed xerostomia using Xerostomia index, clinical oral dryness scale (CODS), and the European League Against Rheumatism SS Patient-Reported Index (ESSPRI), and we assessed hyposalivation using unstimulated whole saliva flow (UWS), stimulated whole saliva flow (SWS), and stimulated parotid flow (SPF). We analyzed the association between xerostomia and hyposalivation using association tests in SPSS. Results: We included a total of 49 patients in this study, of which 34 (68%) had primary SS, and 15 (32%) had secondary. CODS was significantly correlated with SWS (P=0.048), with a negative correlation coefficient of 0.216, and with SPF (P=0.009), with a negative correlation coefficient of 0.291. The dryness domain of ESSPRI was significantly correlated with UWS (P=0.031) with a negative correlation coefficient of 0.233. Conclusion: CODS is the scoring system with the highest correlation with hyposalivation, particularly SWS and SPF, followed by ESSPRI dry domain, which is correlated with UWS. Xerostomia index is not correlated with hyposalivation. Xerostomia and hyposalivation are two concepts used in the diagnostic criteria of SS, which are distinguishable from each other. Xerostomia is a subjective measure, when the patient reports a daily feeling of dry mouth, while hyposalivation is an objective quantifiable measure of reduced saliva flow rate.5 Multiple scoring system has been developed to assess xerostomia and several tests for hyposalivation. Three scoring systems we will discuss in our study include Xerostomia index (XI), clinical oral dryness scale (CODS), and the European League Against Rheumatism SS Patient-Reported Index (ESSPRI).6–8 Other scoring systems include Profile of Fatigue and Discomfort (PROFAD)9 and Sicca Symptoms Inventory (SSI).10 The idea behind PROFAD and SSI development was that the main symptoms of patients with SS are dryness, pain, somatic, and mental fatigue, so these scores were developed to assess these symptoms – PROFAD for fatigue and discomfort and SSI for evaluation of dryness features. On the other hand, hyposalivation can be assessed either without saliva stimulation (unstimulated whole saliva flow [UWS]) or with saliva stimulation (stimulated whole saliva flow [SWS] and stimulated parotid flow [SPF]), each of which has its own characteristic features.11 For instance, stimulated flow is less subjected to variation more than unstimulated tests, while stimulated tests are sometimes difficult to obtain.11,12 Although the main concern for clinical practitioners is xerostomia rather than hyposalivation,5 previous studies stressed on the strong relationship between hyposalivation and general health.13 In this study, we aim to find the association of commonly used xerostomia assessment scores, including XI, CODS, and ESSPRI, with different hyposalivation tests. This study’s data were obtained from the randomized controlled trials that studied the effect of sialendoscopy on salivary gland function in patients with SS,14,15 registered at the US National Institutes of Health (ClinicalTrials.gov; number: NCT02112019). All patients signed a written consent. UWS: patients were instructed to start collecting saliva immediately after an initial swallow, and subsequently expectorate into a pre-weighed container every 30 seconds for a 5-minute period. SWS: patients were asked to chew a 5×5 cm sheet of paraffin (Parafilm M, Pechiney, Chicago, IL, USA) and expectorate into a pre-weighed container every 30 seconds during a 5-minute period. SPF: collected in plastic tubes from each parotid gland using modified Lashley cups. Stimulation with citric acid (2% w/v) was applied with a cotton wool swab to the lateral border of the tongue at 30-second intervals. Patients were instructed to refrain from eating/chewing, drinking, brushing teeth, and smoking for 90 minutes prior to these tests. Xerostomia inventory:6 an 11-item score with responses from “Never” to “Always” in a Likert scale. A high total score indicates extremely dry mouth. Clinical Oral Dryness Scale:7 a 10-point clinical scale, with a score of 1 assigned to each item. A high total score indicates increased xerostomia severity. European League Against Rheumatism SS Patient-Reported Index:8 a 10-point scale for each of oral dryness, pain, and fatigue domains. As we are comparing xerostomia assessment questionnaires, only dryness domain was included. A high total dryness domain score indicates increased xerostomia severity. 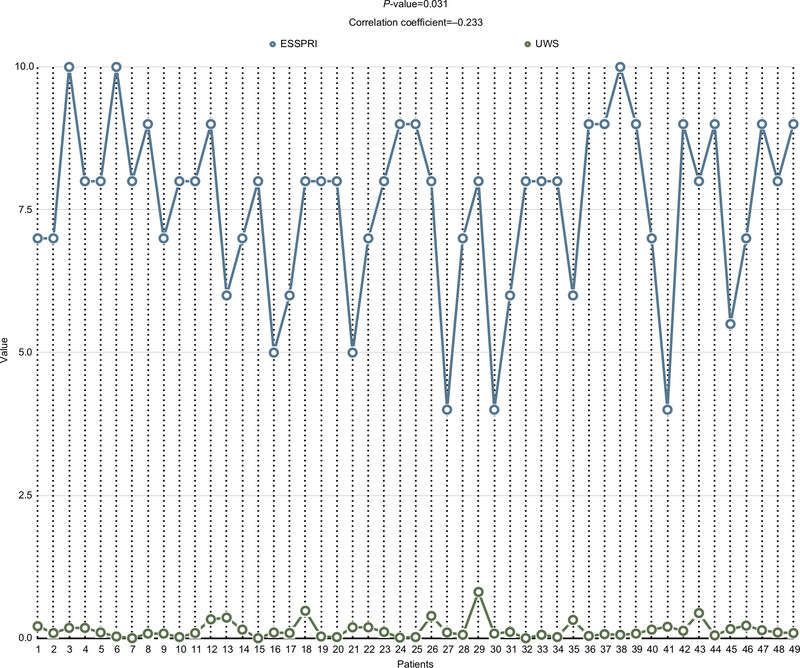 We used SPSS version 21.0 (Chicago, IL, USA) in our analysis. We used mean (± SD) to describe age, UWS, SWS, and SPF. We used count (frequency) to describe gender, and primary or secondary SS. As the data are nonlinear and nonmonotonically distributed, we used Kendall’s tau test to analyze the correlation between USS, SWS, and SPF and the total score of CODS, XI, and ESSPRI. Moreover, we used Kendall’s tau test to find the correlation between the questionnaires (CODS, XI, and ESSPRI). We reported the results in terms of correlation coefficient and its significance level. A P-value of <0.05 was used as the significant threshold. We included a total of 49 patients in this study with a mean age of 59 (±10.4) years. There were 43 (87.8%) women and 6 (12.3%) men. Thirty-four (68%) had primary SS. 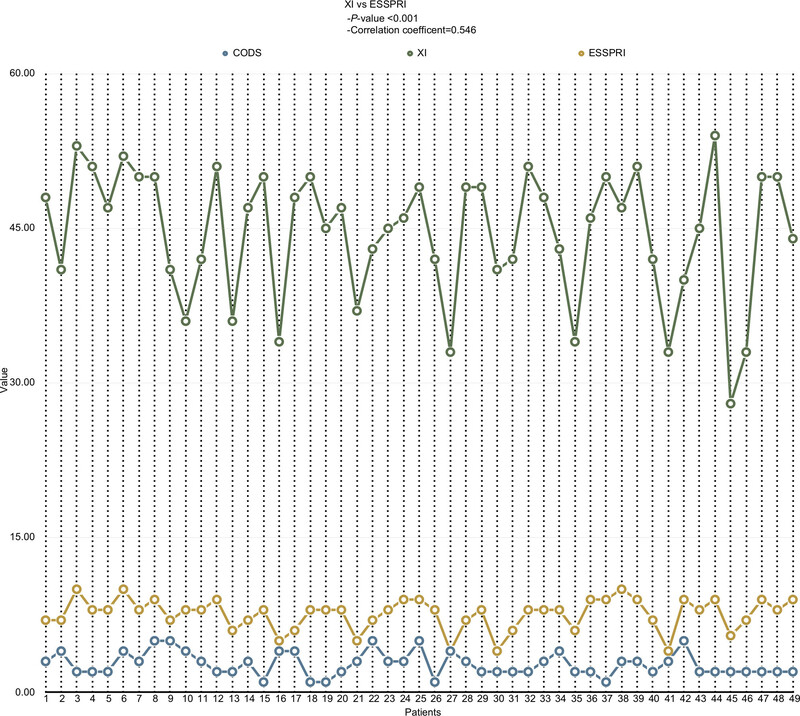 The mean UWS was 0.14 (±0.15) mL/min, SWS was 0.46 (±0.44) mL/min, and SPF was 0.22 (±0.26) mL/min. CODS was significantly correlated with SWS (P=0.048), with a negative correlation coefficient of 0.216, and with SPF (P=0.009), with a negative correlation coefficient of 0.291. The dryness domain of ESSPRI was significantly correlated with UWS (P=0.031) with a negative correlation coefficient of 0.233. Figures 1–3 show the correlations of CODS vs SWS, CODS vs SPF, and ESSPRI vs UWS, respectively. 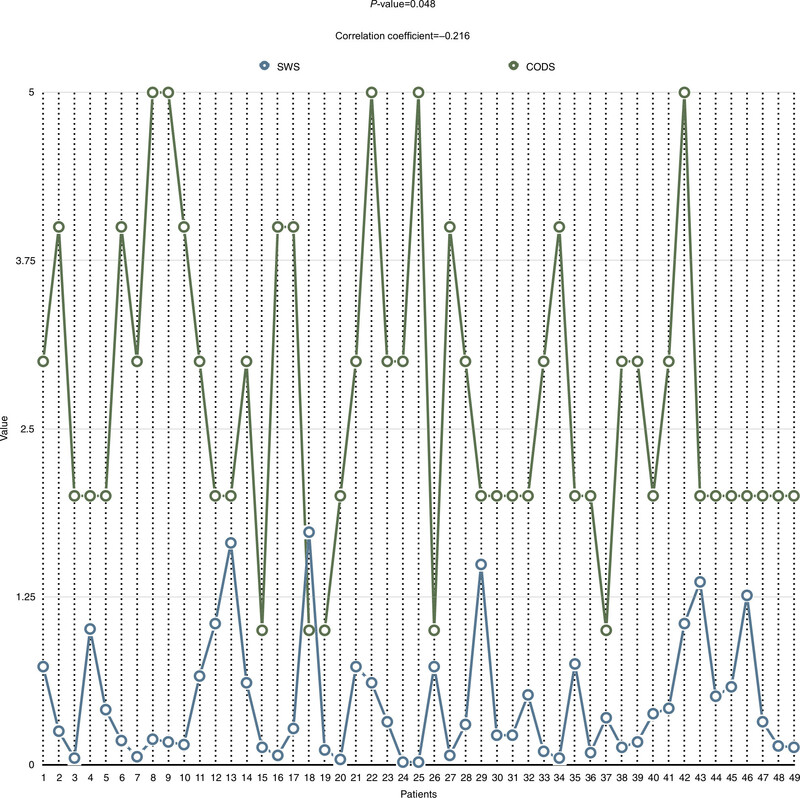 Figure 1 Correlation between CODS and SWS, where each vertical line represents a patient. 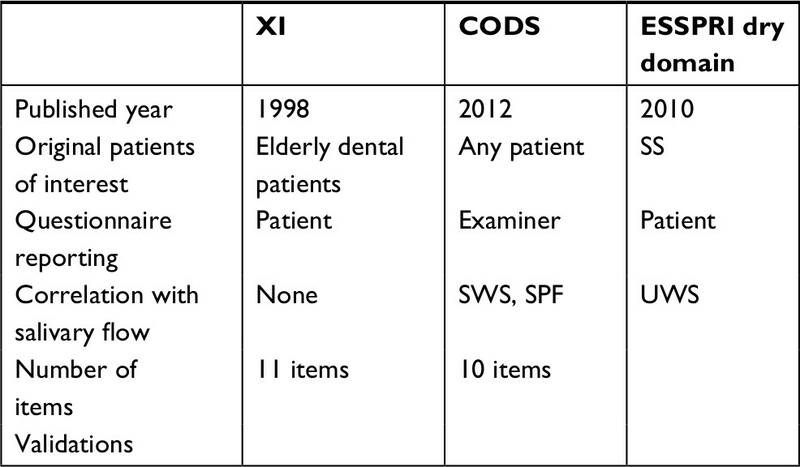 Abbreviations: CODS, clinical oral dryness scale; SWS, stimulated whole saliva flow. 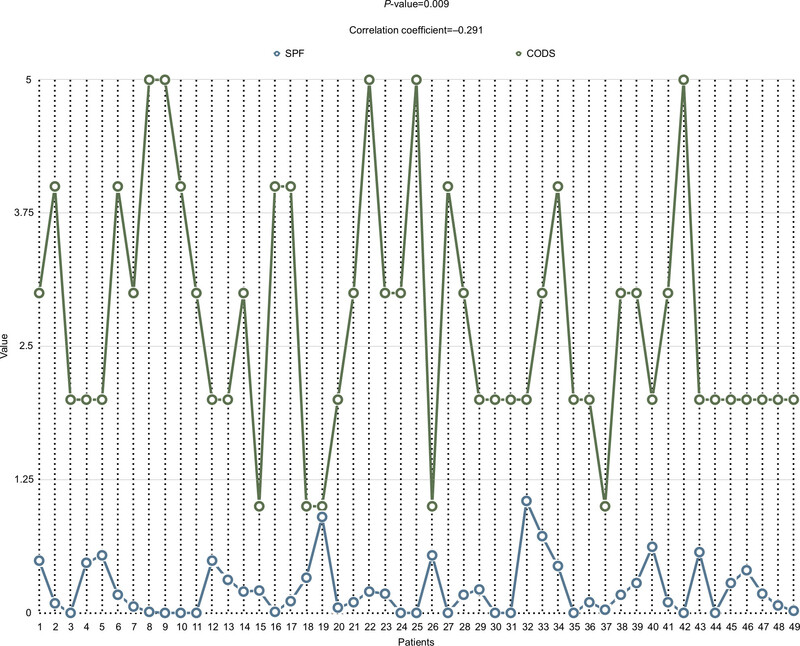 Figure 2 Correlation between CODS and SPF, where each vertical line represents a patient. Abbreviations: CODS, clinical oral dryness scale; SPF, stimulated parotid flow. Figure 3 Correlation between ESSPRI and UWS, where each vertical line represents a patient. Abbreviations: ESSPRI, European League Against Rheumatism SS Patient-Reported Index; SS, Sjogren’s syndrome; UWS, unstimulated whole saliva flow. Only XI and dryness domain of ESSPRI were significantly correlated (P<0.001) with a positive correlation coefficient of 0.546. The correlation between the three tools involved is shown in Figure 4. We did not find significant age or gender differences regarding either USS, SWS, and SPF, or the total score of CODS, XI, and ESSPRI. Figure 4 The correlation between the three tools involved: XI, CODS, and ESSPRI. Abbreviations: CODS, clinical oral dryness scale; ESSPRI, European League Against Rheumatism SS Patient-Reported Index; SS, Sjogren’s syndrome; XI, Xerostomia inventory. Upon comparing the association between XI, CODS, and dryness domain of ESSPRI with hyposalivation measuring tests, CODS significantly and negatively correlated with stimulating flow tests (SWS, SPF), whereas dryness domain of ESSPRI significantly and negatively correlated with the UWS. For XI, we did not find significant correlation with any hyposalivation tests (Table 1). Abbreviations: CODS, clinical oral dryness scale; ESSPRI, European League Against Rheumatism SS Patient-Reported Index; SPF, stimulated parotid flow; SS, Sjogren’s syndrome; SWS, stimulated whole saliva flow; UWS, unstimulated whole saliva flow; XI, Xerostomia index. ESSPRI is a patient index designed by the European league against rheumatism in 201110 to measure patient’s symptoms in primary SS, with participation of a large multinational panel of patients with primary SS. It consists of four domains: dryness, pain, somatic, and mental fatigue with a single 0–10 numerical scale for each domain. Dryness features include (ocular, oral, skin, nasal, tracheal, and vaginal). The main strength of this recently developed questionnaire is the multinational panel of patients included for its development, including patients from European, and both North and South American countries.25 This finding further supported the use of this instrument in intervention studies and in clinical practice.26 A main drawback of the primary ESSPRI study is that it did not involve objective assessment of dryness, which precludes the comparison with ours. A previous study that included patients with primary SS did not find a clear association between ESSPRI score and SWS flow,27 which is in concordance with our study. Furthermore, we found a significant negative correlation between ESSPRI dryness domain score and UWS flow. This study provided a comparison between three tools used in the assessment of xerostomia in SS patients. The newly developed CODS is associated with stimulated salivary flow tests (ie, SWS and SPF). XI is not correlated with any objective hyposalivation tests. Finally, ESSPRI dryness domain is associated with the UWS. This is the first study to compare the three tools together, which will guide prospective researchers in choosing the best tool according to their study aim. Tincani A, Andreoli L, Cavazzana I, et al. Novel aspects of Sjögren’s syndrome in 2012. BMC Med. 2013;11:93. Reksten TR, Jonsson MV. Sjögren’s syndrome: an update on epidemiology and current insights on pathophysiology. Oral Maxillofac Surg Clin North Am. 2014;26(1):1–12. Mavragani CP, Moutsopoulos HM. Sjögren syndrome. CMAJ. 2014;186(15):E579–E586. Carr AJ, Ng WF, Figueiredo F, Macleod RI, Greenwood M, Staines K. Sjögren’s syndrome - an update for dental practitioners. Br Dent J. 2012;213(7):353–357. Nederfors T. Xerostomia and hyposalivation. Adv Dent Res. 2000;14:48–56. Thomson WM, Chalmers JM, Spencer AJ, Williams SM. The Xerostomia Inventory: a multi-item approach to measuring dry mouth. Community Dent Health. 1999;16(1):12–17. Osailan SM, Pramanik R, Shirlaw P, Proctor GB, Challacombe SJ. Clinical assessment of oral dryness: development of a scoring system related to salivary flow and mucosal wetness. Oral Surg Oral Med Oral Pathol Oral Radiol. 2012;114(5):597–603. Seror R, Ravaud P, Bowman SJ, et al; EULAR Sjögren’s Task Force. EULAR Sjogren’s syndrome disease activity index: development of a consensus systemic disease activity index for primary Sjogren’s syndrome. Ann Rheum Dis. 2010;69(6):1103–1109. Bowman SJ, Booth DA, Platts RG; UK Sjögren’s Interest Group. Measurement of fatigue and discomfort in primary Sjogren’s syndrome using a new questionnaire tool. Rheumatology (Oxford). 2004;43(6):758–764. Bowman SJ, Booth DA, Platts RG, Field A, Rostron J; UK Sjögren’s Interest Group. Validation of the Sicca Symptoms Inventory for clinical studies of Sjögren’s syndrome. J Rheumatol. 2003;30(6):1259–1266. Humphrey SP, Williamson RT. A review of saliva: normal composition, flow, and function. J Prosthet Dent. 2001;85(2):162–169. Speight PM, Kaul A, Melsom RD. Measurement of whole unstimulated salivary flow in the diagnosis of Sjögren’s syndrome. Ann Rheum Dis. 1992;51(4):499–502. Flink H, Bergdahl M, Tegelberg A, Rosenblad A, Lagerlöf F. Prevalence of hyposalivation in relation to general health, body mass index and remaining teeth in different age groups of adults. Community Dent Oral Epidemiol. 2008;36(6):523–531. Karagozoglu KH, Vissink A, Forouzanfar T, Brand HS, Maarse F, Jager DHJ. Sialendoscopy enhances salivary gland function in Sjögren’s syndrome: a 6-month follow-up, randomised and controlled, single blind study. Ann Rheum Dis. 2018;77(7):1025–1031. Karagozoglu KH, Vissink A, Forouzanfar T, Brand HS, Maarse F, Jager DHJ. Sialendoscopy enhances salivary gland function in Sjögren’s syndrome: a 6 month follow-up, randomized and controlled, single blind study. Dryad Digital Repository. 2018. Vitali C, Bombardieri S, Jonsson R; European Study Group on Classification Criteria for Sjögren’s Syndrome. Classification criteria for Sjögren’s syndrome: a revised version of the European criteria proposed by the American-European Consensus Group. Ann Rheum Dis. 2002;61(6):554–558. Lee J, Koh JH, Kwok SK, Park SH. Translation and validation of a Korean version of the Xerostomia Inventory in patients with primary Sjögren’s Syndrome. J Korean Med Sci. 2016;31(5):724–728. da Mata AD, da Silva Marques DN, Freitas FM, et al. Translation, validation, and construct reliability of a Portuguese version of the Xerostomia Inventory. Oral Dis. 2012;18(3):293–298. Serrano C, Fariña MP, Pérez C, Fernández M, Forman K, Carrasco M. Translation and validation of a Spanish version of the xerostomia inventory. Gerodontology. 2016;33(4):506–512. Thomson WM, van der Putten GJ, de Baat C, et al. Shortening the Xerostomia Inventory. Oral Surg Oral Med Oral Pathol Oral Radiol Endod. 2011;112(3):322–327. Gkavela G, Kossioni A, Lyrakos G, Karkazis H, Volikas K. Translation and preliminary validation of the Greek version of the Xerostomia Inventory in older people. Eur Geriatr Med. 2015;6(3):237–240. He SL, Wang JH, Li M. Validation of the Chinese version of the Summated Xerostomia Inventory (SXI). Qual Life Res. 2013;22(10):2843–2847. Tashbayev B, Rusthen S, Young A, et al. Interdisciplinary, comprehensive oral and ocular evaluation of patients with primary Sjögren’s syndrome. Sci Rep. 2017;7(1):10761. Jager DHJ, Bots CP, Forouzanfar T, Brand HS. Clinical oral dryness score: evaluation of a new screening method for oral dryness. Odontology. 2018;106(4):439–444. Seror R, Theander E, Bootsma H, et al. Outcome measures for primary Sjögren’s syndrome: a comprehensive review. J Autoimmun. 2014;51:51–56. Lendrem D, Mitchell S, McMeekin P, et al; UK primary Sjögren’s Syndrome Registry. Do the EULAR Sjögren’s syndrome outcome measures correlate with health status in primary Sjögren’s syndrome? Rheumatology (Oxford). 2015;54(4):655–659. Meiners PM, Arends S, Brouwer E, Spijkervet FK, Vissink A, Bootsma H. Responsiveness of disease activity indices ESSPRI and ESSDAI in patients with primary Sjögren’s syndrome treated with rituximab. Ann Rheum Dis. 2012;71(8):1297–1302. Pertovaara M, Korpela M. ESSPRI and other patient-reported indices in patients with primary Sjogren’s syndrome during 100 consecutive outpatient visits at one rheumatological clinic. Rheumatology (Oxford). 2014;53(5):927–931. Paganotti MA, Valim V, Serrano ÉV, Miyamoto ST, Giovelli RA, Santos MC. Validation and psychometric properties of the EULAR Sjögren’s Syndrome Patient Reported Index (ESSPRI) into Brazilian Portuguese. Rev Bras Reumatol. 2015;55(5):439–445. Vitali C, Palombi G, Baldini C, et al. Sjögren’s Syndrome Disease Damage Index and disease activity index: scoring systems for the assessment of disease damage and disease activity in Sjögren’s syndrome, derived from an analysis of a cohort of Italian patients. Arthritis Rheum. 2007;56(7):2223–2231.